Jake Rios Torres, 9, watches as Puerto Rico Army Reservists, U.S. Coast Guard Investigative Service Agents, U.S. Coast Guard Tactical Law Enforcement Team members, Puerto Rico Treasury Department Agents, and a Puerto Rico Ports Authority Agent deliver food and water his family that is sharing the only room they have left after Hurricane Maria destroyed their home in the mountains around Utuado, Puerto Rico, Oct. 12, 2017. Flint isn’t the only place where water puts residents at risk. Three years after contaminated drinking water exposed thousands of children to toxic lead in Flint, Michigan, the crisis still affects the city’s residents in insidious ways. Scientists suggest that the elevated lead levels may be causing miscarriages, affecting infant health, and affecting reading levels among Flint third-graders. But Flint isn’t the only the US city where disasters prevent people from turning on their taps and where other bizarre water problems put residents at risk. Worldwide, including IN parts of the US, access to clean water reflects inequalities based on income level, race, and ethnicity. Roughly 2 billion people don't have reliable sources of clean drinking water and one child every minute dies from preventable waterborne diarrheal disease. That's why Global Citizen campaigns on ensuring everyone in the US and around the world has access to safe, healthy, and reliable drinking water. You can take action here. While the residents of Flint continue to experience the effects of citywide lead contamination, these five cities face water debacles of their own. In theory, the United Nations says, water is a universal human right. But in practice, even in the world’s wealthiest country, water is out of reach for many low-income people. Just ask thousands of Detroit residents who had their taps shut off over the past few years because they couldn’t afford to pay the water bills. But four years later, the impossible choices continue. For years, Modesto has fought against industrial giants like Dow Chemical that manufacture toxic dry-cleaning chemicals threatening the city’s water system. Dow and the other manufacturers knew that the chemical perchloroethylene — known as perc or PCE — was poisonous but still instructed cleaners to pour it down the sewer. The city and state government routinely test Modesto’s water and deem it safe for human consumption, but the chemical, which the Environmental Protection Agency regards as a “likely human carcinogen,” still threatens to seep into wells. 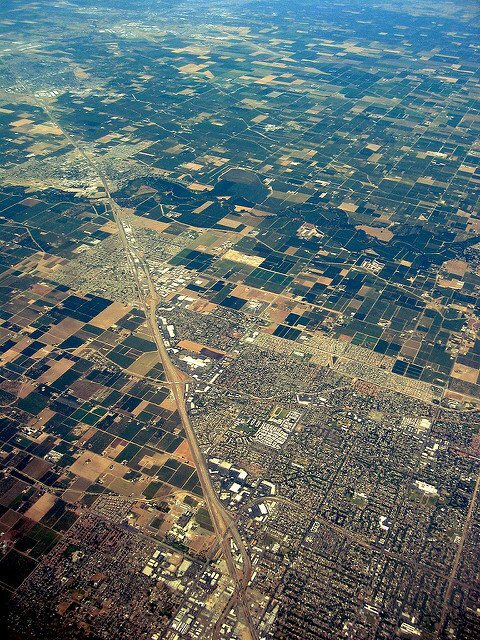 Meanwhile, Modesto, home 212,000 people, also contends with uranium runoff, a problem for towns across the western US. In response, the city has installed equipment to detect uranium — a byproduct of irrigation and drought in many farming regions. The 2012 film “Promised Land,” starring clean-water champion Matt Damon and John Krasinski, shined a light on the threat to groundwater posed by hydraulic fracturing — or fracking. But people in North Texas don’t need Netflix to understand the problem. They experience it first-hand. When a team of researchers from the University of Texas at Arlington studied private wells in the Dallas-area, they discovered dangerous levels of arsenic, which they attributed to fracking. Four months after Hurricane Maria, more than 400,000 Puerto Ricans remain without power and running water. In towns like Coamo, residents depend on donations and Federal Emergency Management Administration relief to access clean water. And in Morovis, a mountain town southwest of San Juan, residents face an uphill climb to fulfill their basic needs. "I've lived here 44 years. All my life. Every day is very difficult. Getting water. Living. It's very hard," one resident told ABC News. Statements by FEMA about pulling out of the island territory in January prompted an outcry from Puerto Ricans and advocates around the world who understood that the crisis continues for those without reliable water. They recalled the early days of the hurricane relief effort when many Puerto Ricans, stuck without potable water, turned to polluted streams as their drinking source. At least five people died from leptospirosis, a disease carried in animal urine that contaminated Puerto Rican waterways after the storm. Capitalizing on a vague distrust of municipal water supplies, Silicon Valley financiers are enabling consumers to purchase expensive, untreated water. The US Centers for Disease and Control specifically warns against drinking untreated water because it could be contaminated with potentially fatal diseases like cholera and typhoid. Nevertheless, some consumers say they want untreated water — despite the health risks — because they don’t trust the fluoride and other chemicals added to their water by municipal treatment facilities.